On-battery" alarm protects sealed and flooded lead-acid batteries from over-discharge. 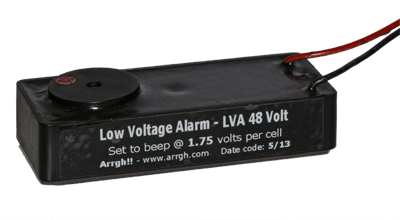 Alarm reference voltage tailored to the battery. Prevents over-discharge, especially damaging to sealed batteries. Supplements or replaces battery discharge indicator on vehicle. Intermittent sound when battery needs to be recharged. Potted to protect against sulfuric acid. Alarm reference voltage fixed, not adjustable. 4" x 1-5/8" x 1"
Magnetic back adheres to battery steel. Use plastic ties to attach to an inter-cell connector. Three year limited warranty—excludes water and sulfuric acid damage. 3 wires -- one to battery +, one to battery -, one to 12VDC. 4th. wire optional -- attach to an external horn for a noisy environment. Sealed battery 1.99 volts per cell. Flooded battery 1.85 volts per cell or as specified by customer at time of order.